Newly planted Sum and Substance Hosta. I listen to a lot of podcasts during my extensive driving. On a recent road trip, my mom and I listened to A Way to Garden, which is a podcast that I love. As an aside, I’ve recently learned that I absolutely love listening to people speak quietly and in great detail on a subject about which they are passionate. This could be due to my ten years in higher education, where I listened to a lot of professors conduct their classes in this manner. I’m not exactly sure what it is, but I’ve liked it for a long time, and only recently have been able to put my finger on it. Back to the point, this gardening podcast is great if you love to hear people talking in hushed, excited tones about gardening. For me, that’s perfection. So, while we were traveling, my mom and I listened to the podcast on hostas (here’s the accompanying blog post). I hadn’t really known much about hostas, but the podcast really piqued my interest. 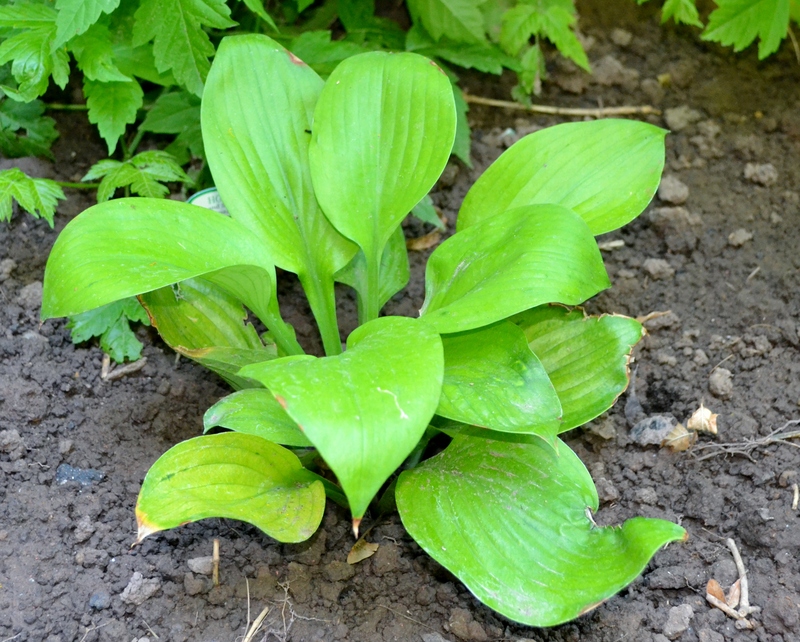 An ex-boyfriend had hostas at his place. They never did much, but he loved them and worried over them, and that’s what really put the plant on my radar. 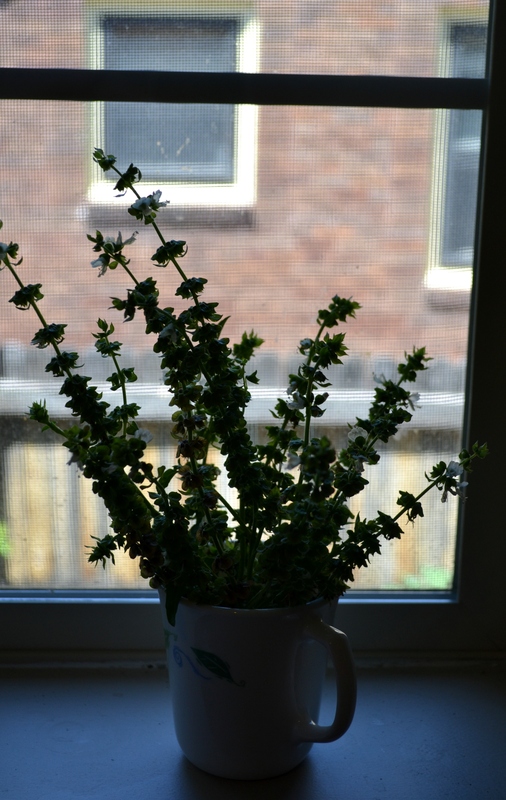 In late summer, when my traveling had died down a bit, I bought some half-priced, half-dead flowers to fill an unpromising patch of soil I had prepared on the north end of my home. The nursery also had some beautiful hosta plants, and with the podcast still ringing in my ears, I spontaneously purchased their largest hosta, called Sum and Substance. From the podcast, I learned that some hostas have been bred to have fragrant flowers. 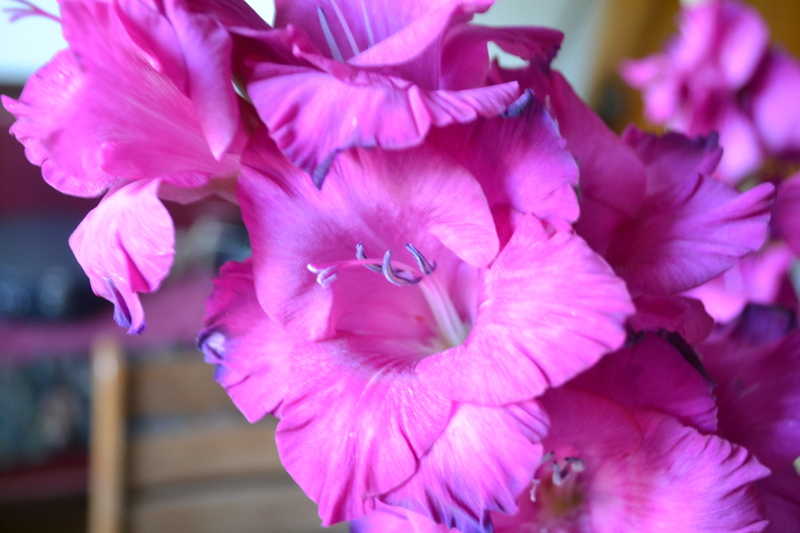 The attendant at the greenhouse didn’t know anything about that, and I haven’t found much about it online, but some of the varieties had flowers blooming, and I noticed that Sum and Substance had a very light, sweet, fragrance. Sum and Substance is also one of the largest varieties. The area I had prepared is north facing and has minimal light. A tree that was removed last year is coming back with a vengeance in bush form, and it’s taking away even more light from the area. The soil is also fairly poor and appears to be mostly clay, despite my attempts at amending it. 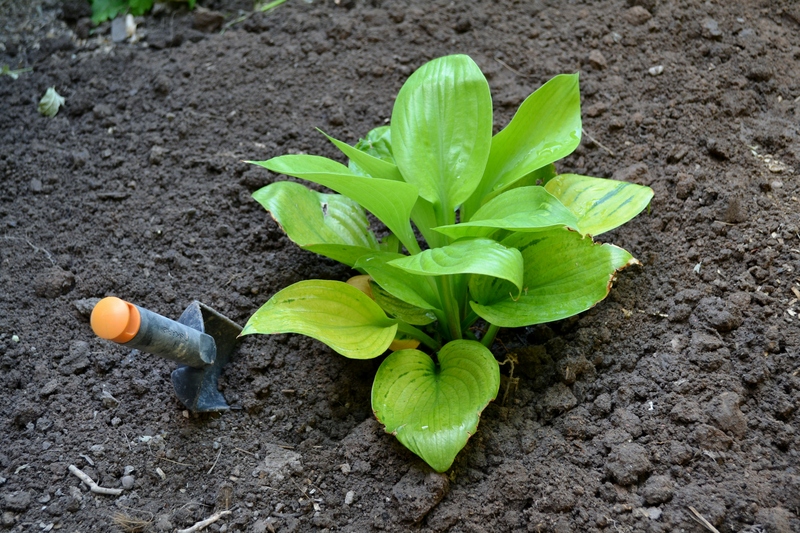 Hostas are known for doing okay in these kinds of conditions, so I figured I’d give it a try. Sum and Substance Hosta after being in the ground for about a month and a half. The hosta has been in the ground for about a month and a half now. It hasn’t done much, but now that I compare pictures, I can see that the foliage really had grown. I hope this hosta giant really takes over the space. The foliage is still really bright and healthy looking, and I’m hoping that it’s putting most of it’s energy into it’s roots right now. I think I’ll know more next year. The Sum and Substance hosta is supposed to get huge. We’ll see how much growing it does next year…if it survives the winter. 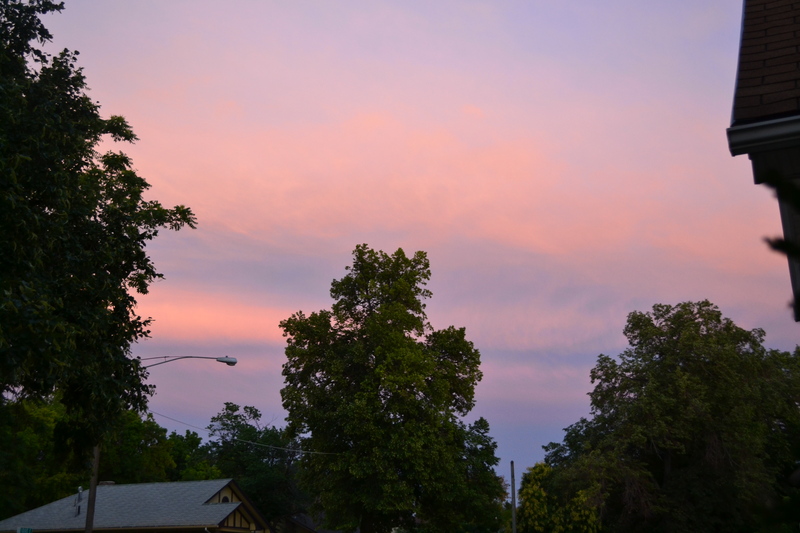 This entry was posted in garden, life, travel, Uncategorized on August 30, 2013 by sherewin. My introduction to Barbara Kingsolver happened over a decade ago when I first read her debut novel, The Bean Trees. At the time, I loved the book. I had just discovered popular, contemporary women writers, and I could not get enough. I can’t remember exactly what went down in The Bean Trees, but it had to do with a woman living life on her own terms, a theme that makes me weak in the knees. There was probably also some troubling imperialist nostalgia stuff going on there too, but, like I said, it’s been over a decade. Who can remember? I hadn’t read Kingsolver for many years, when I picked up her latest book, Flight Behavior. The book takes place in Appalachia and centers on Dellarobia, an uneducated, but curious and sympathetic character, who is trapped in an unhappy marriage, which is really just an unhappy life. That life is changed forever when the family land is inundated with monarch butterflies, whose migratory patterns are disrupted by climate change. The butterflies are the catalyst for opening up a world of possibilities and [spoiler alert!] ultimately leading Dellarobia to self fulfillment and transformation. The message is education and information are key. The book has everything I love: a down on her luck Appalachian woman, monarch butterflies, and sheep! It’s everything I look for in a novel, and yet the book sometimes fell flat. Kingsolver is writing from a rural poor Appalachian perspective, but in many ways Kingsolver herself seems to lack that perspective. I think of myself as someone who understands both sheep farming and the rural poor (though, to be fair, not the Appalachian variety), two things that are dealt with extensively in the novel. The book demonstrates that Kingsolver is a scientist at heart and a keen observer of humans and nature, but seems one step removed. In regards to the sheep details, I recognized most of the information from a sheep raising manual written by Carol Ekarius, who herself is a transplant to sheep farming and a hobby farmer. 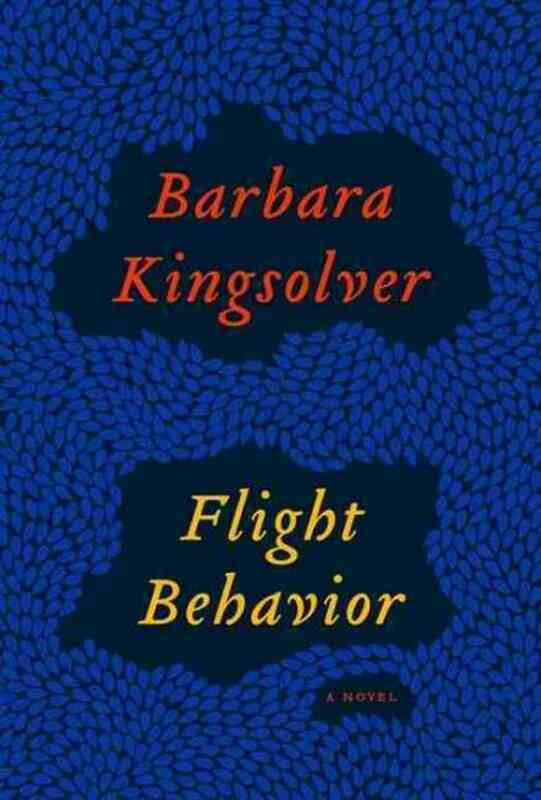 In Flight Behavior, these characters are trying to make a living off of sheep, and to do so, they would need a completely different approach than the hobby farming Kingsolver portrays. Next, it has been my experience that the rural poor have a certain pride, but the Dellarobia character has none of that pride. She is just completely insecure and humiliated by her life in every way. This is made clear as visitors and highly educated scientists begin to visit the butterflies. Even the transformed Dellarobia seemed to lack some necessary perspective in regards to her own behavior. I guess that’s reality though, isn’t it? When I hear “Appalachian women’s literature,” my heart melts a little bit. If you’re like me, Flight Behavior is worth reading. If environmentalist gets your blood pumping, you’ll probably love the book. If you find that this book isn’t for you, do go back and read her first book, though. That one was a real gem. This entry was posted in books, reading, writing and tagged climate, kingsolver, nature, science on August 4, 2013 by sherewin. About a week ago, I wrote that I was worrying about my tomato plants. They had hung in the basement for about four days while I was away on vacation, and they had failed to make any new blossoms ever since. They were still going a good job of ripening what was on the vine, but nothing new was forming. Well, a few days after that post, I saw the first two new blossoms, and since then quite a few new blossoms have formed on both plants. Tomato season is not over yet! 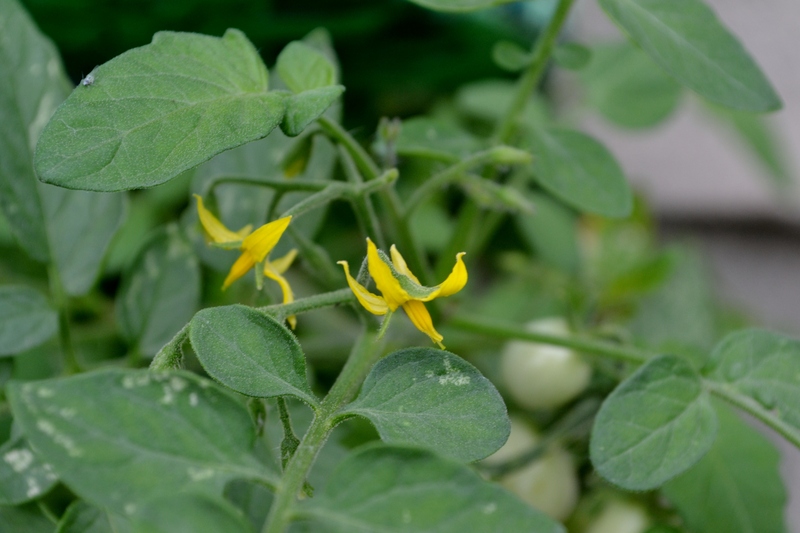 New tomato blossoms at long last! 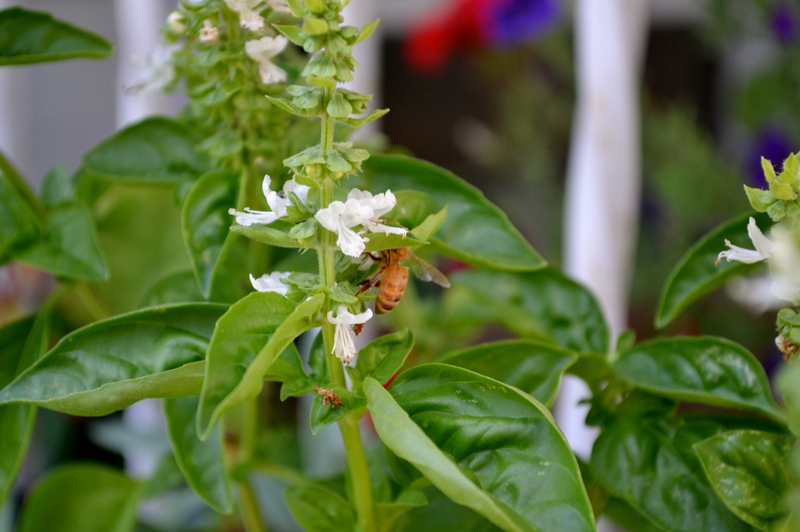 This entry was posted in garden, travel and tagged blossoms, patio garden, tomato plants on August 2, 2013 by sherewin.